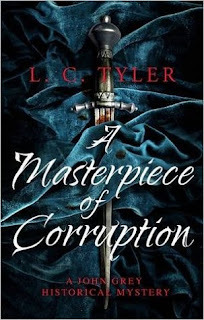 Today I am very excited to welcome L C Tyler to the Blog in celebration of the publication of his second John Grey historical novel 'A Masterpiece of Corruption', which is Published TODAAAAY. The novel takes us back to 1657 where lawyer John Grey receives a mysterious invitation leading him to a mysterious meeting where he gets caught up in a conspiracy if lies, corruption and a plot to kill the Lord Protector Oliver Cromwell! Its a great way to get your history buzz going in the new year and you can check out our full review of the novel HERE. 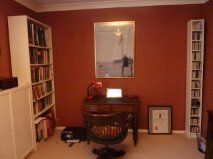 First up something visual (and something I've really enjoyed seeing from different authors)...can you share with is a picture of where you like to write? Can you share with us some of the more interesting or strangest facts you’ve uncovered whilst writing these books? One of the many myths about early modern times is that nobody drank water. Then you read Pepys and he’s drinking it all the time. How do you go about writing a character like Cromwell that is so well historically known. A bit of research and a bit of imagination! He wasn’t the rather grim figure that many people assume. He rather enjoyed practical jokes and had a nice line in irony. Generally, with Cromwell and other real figures you include on the book, you take what you can find, preferably from contemporary sources, and extrapolate. Powerful men of any period have a lot in common. One mistake that you should not make however is to assume in doing this that your character was simply a twenty first century man plonked down in the seventeenth century. What he or she believed about God or witchcraft or democracy would have been shaped by their own time. They’d probably think our own beliefs on a lot of things were odd, verging on the blasphemous. What is it about this period that appeals to you and that still appeals to people? It was a time of remarkable contrasts – the moral certainties of the republican period set against the laxity in every respect of the Restoration, the burgeoning of scientific enquiry set against the persecution of witches, a society in transition. And some of the strangest men’s fashion ever – wigs, ribbons, petticoat breeches – it had the lot. How important is it to maintain a balance of historical fact and historical fiction? I think you can go for whatever balance you like, but the reader has to know what is real and what you’ve made up. If you have a framework of real events, real people, then they have to be as true as you can make them. If you could have dinner with one historical character who would it be? Lady Castlemaine, King Charles’s mistress. Pepys was fascinated by her. And she’d have plenty of stories to tell! If you were able to go back to one period of time, where would you go and why? Probably to the seventeenth century so that I could check a few of my facts! What next can we expect from John Grey? We have one copy of A masterpiece of corruption to give away. To enter comment below amd let us know which historical figure YOU would have round for dinner and why.